the death must be reported to the local Office of the Coroner. Asphyxiation by gagging on foreign substance, including food in airway; compression of the airway or chest by hand, material, or ligature; drowning; handling cyanide; exclusion oxygen; carbon monoxide; and/or other gasses causing suffocation. Drug overdose from medication, chemical or poison ingestion, (actual or suspected). This includes any medical substance, narcotic or alcoholic beverage, whether sudden, short or long term survival has occurred. Stillborn or newborn infant death where there is a recent or past traumatic event involving the mother, such as vehicular accident, homicide, suicide attempt, or drug ingestion that may have precipitated delivery or had a detrimental effect to the newborn. Vehicular accidents, including auto, bus, train, motorcycle, bicycle, watercraft, snowmobile or aircraft, including driver, passenger, or related non-passenger, (e.g. such as being struck by parts flying or thrown from a vehicle). Weather related death (e.g. lightning, heat exhaustion, hypothermia or tornado). Instances in which the environment of present or past employment may have caused or contributed to death by trauma or disease. Deaths in this classification include caisson disease (bends), industrial infections, pneumoconiosis, present or past exposure to toxic waste or product (e.g. nuclear products, asbestos or coal dust), fractures, burns or any other injury received during employment or as a result of past employment, which may have contributed to death. DOA - Any person pronounced dead on arrival at any hospital, emergency room of a hospital or doctor's office shall be reported. Infants and young children ñ Any infant or young child found dead shall be reported, including Sudden Infant Death Syndrome (5.1.0.5. or Crib Death). All stillborn infants where there is suspected or actual injury to the mother. All deaths occurring within 24 hours of admission to a hospital unless the patient has been under the continuous care of a physician. Sudden death on the street, at home, in a public place, or at place of employment. Drug abuse, habitual use of drugs or drug addiction. Any maternal or infant death where there is suspicious or illegal interference by unethical or unqualified persons or self-induction. 2) hip fractures of the elderly where there is a downward course of condition after the injury. Death occurring under the influence of anesthesia, during the anesthetic induction, during the post-anesthetic period without the patient regaining consciousness (including death following long-term survival if the original incident is thought to be related to the surgical procedure and/or anesthetic agent). Death during or following any diagnostic or therapeutic procedure, whether medical or survival time, if death is thought to be directly related to the procedure or complications from said procedure. Death due to the administration of a drug, serum, vaccine, or any other substance for any diagnostic, therapeutic or immunological purpose. Any Death Where There is a Doubt, Question or Suspicion Not all reported cases fall into the above noted categories. After the investigation is completed, many will be returned to the jurisdiction or institution where the death certificate will be signed by the attending physician as a natural death. 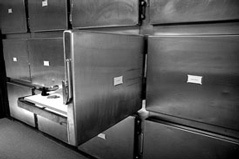 Only the Coroner can legally sign a death certificate of a person who has died as a direct or indirect result of any cause listed in the previously noted reportable deaths.